Táve gives you the ability to schedule your emails to send at a later time and date. Maybe you’re a night owl who composes emails in the middle of the night or you want to send an email at the ideal time to make sure it’s read. Email scheduling now gives you the flexibility to have emails go out when you need them to go out. At 8am – Sends at the start of the business day. At a specific time – You set the date and time! That’s it! Your message will be marked as ‘Scheduled’ awaiting the moment it’s set to send. You can hover over the schedule tag to see what time it’s scheduled for. You can also edit the message any time before it’s scheduled. All of your scheduled emails will appear in the new dashboard widget so you can quickly see which emails are ready to go out and when. Click the ‘View’ button to be taken to the email to change its content or scheduled time or click on the ‘All Scheduled Mail’ button to go to the outbox to see all emails you have set to send. 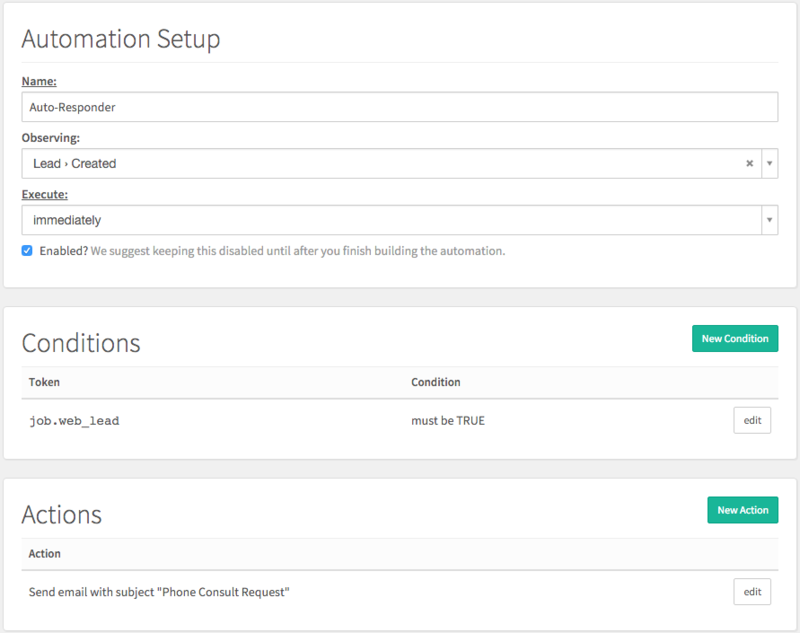 Quick tip: You can configure how many scheduled emails appear in the widget by going to the ‘Configure Dashboard’ section of the home page. In addition to being able to schedule a normal email to go out at a later time, you can now set a delay for automation emails. Using the ‘Send Email’ automation action, you can set it so the email goes out immediately when the automation executes, waits however many minutes you specify, or doesn’t send at all but saves the message as a draft so that you can review it before sending. You can now build a personal auto-responder that doesn’t feel too automatic. Set up a new automation that is observing whenever a new lead is created. Add the condition to make sure that’s it’s a web lead that comes through your contact form (not one you created manually from the dashboard). Then set the ‘Send Email’ action to send the message 5 minutes after the lead is created. Voila! An email that doesn’t feel like it’s so immediate it must have been automated.